I’m going through the summer schedule today, and it looks like it’s a busy one. Usability testing, video scripting and vetting, data analysis, conference planning, presentation creation, lots and lots of article writing, and bribing journal editors to publish me after writing said articles. My job schedule aside, I have some plans for http://yobj.net during this summer as well. First, I’ll probably be tinkering around with the blog code so it can be nice and validate or come very close to validating so there won’t be many accessibility issues. The front page may see some more content and maybe even a little CSS, but that depends on my mood at the moment. I should have some form of this website up and running by the end of summer, right when the students come back. 😉 If any of you would be interested in helping with this project, leave a comment below or email me at b.yoose (AT) gmail (DOT) com. A thread about cataloging and cataloger training in library school stated after someone offered their opinion about the ALA Task Force on Library Education report. This thread went down the very worn path of the theory v. practice argument until a paraprofessional added a (very) underrepresented perspective in the current cataloging skills and training debate. She has the experience, does professional development, enjoys what she does, and (the most important point) she is training the MLS Librarian in cataloging. There is a better way of asking this question, and it does not involve the word “refuse.” Do every paraprofessional want to be a professional librarian? The paraprofessional who helped me didn’t even want to be called a librarian. People have their reasons: financial, professional, or they may be content as to where they are in their careers. If you want to alienate the part of your library staff that run the place, repeat the above. The library field has been in the throes of questioning the professionalism of librarianship for a long time. The movement of paraprofessionals taking over duties previously done by librarians in Technical Services added fuel to the professionalism fire. The above cataloger indicates a worldview of us v. them (Librarians v. “catalogers”). If the degreed librarians don’t stand up against paraprofessionals taking their duties, the future for Librarians in TS is dim. Then again, what makes a librarian a librarian? Is it the day to day duties she performs? If librarians were librarians based on those duties, then it would serve us right to be booted out the door. Paraprofessionals are cheaper for these duties, and I have no problem with that. Do ideas and the drive to innovate make a librarian? Sure, but then again, does this mean that paraprofessionals do not have ideas and a desire for innovation themselves? Heck, where would that leave all the non-library techies who build new discovery platforms? If administrators are not looking at expensive degreed librarians for positions, then the degreed librarians need to take it upon themselves to prove to the admins that they are valuable. Saying that you can catalog is one thing – anyone can catalog, given a few training sessions. You are not your duties. You are your ideas, your spirit of innovation, your aspirations. Why should they hire you? Both positions start reviewing applications July 6th. Good luck, everyone! What We Talk About When We Talk About FRBR by Jody Schneider and William Denton. This talk was by far the best talk about FRBR I have heard, and I have sat through many, many FRBR talks. If you are still unclear about FRBR (which, if my assumption is correct, the majority of you out there), this talk will definitely clear some of the fog around FRBR. LibX 2.0 by Godmar Back. LibX has been around for a while, and if your library doesn’t have this app, place this on the top of your to-do list. If you do have LibX (yay!) this presentation will get your idea engine running. A New Platform for Open Data – Introducing ‡biblios.net Web Services by Joshua Ferraro. This is the mandatory LibLime mention. I dedicate this non-blog to St. Minutia, patron saint of catalogers. 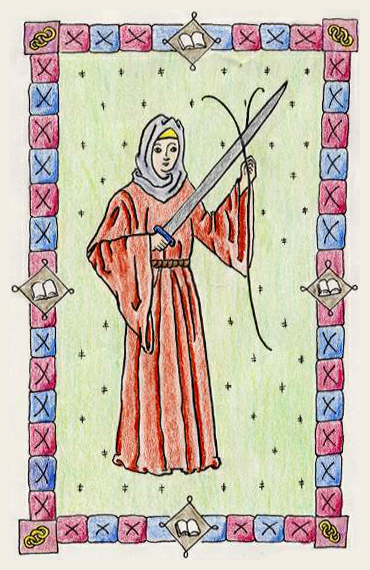 Please click on St. Minutia’s picture for more information about her.